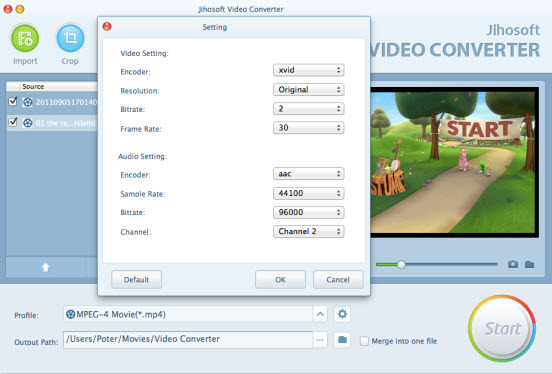 Jihosoft HD Video Converter for Mac is a great application to help you convert high definition videos on Mac OS X. It allows you to convert any HD videos, like AVCHD (MTS, M2TS), HD TS, HD MPEG, HD WMV, HD MPG, HD MP4, QuickTime MOV, HD H.264, etc with high quality. Besides, this Mac HD video converter also owns the solution for converting SD to HD, or SD to SD video. Key Features of Jihosoft HD Video Converter for Mac - Convert HD footages from Sony, Canon, Nikon, Panasonic, JVC, etc - Convert any video files to HD video - Trim, crop, merge or watermark imported videos - Convert video for popular devices and applications Convert HD Videos on Mac Easily Convert among HD videos (including 1080P, 720P, etc. ), and convert HD video to general videos. Supported file types include AVCHD (mts, m2ts), HD ASF, HD AVI, H.264/AVC, HD Quick Time, HD MPEG-4, AVI, MPEG, WMV, MP4, 3GP, FLV, RM, MOV, MP3, WMA, and more. Support for Most Digital Devices All ready-made profiles are optimized for HD video devices and popular digital devices including PS3, Xbox 360, Apple TV, iPad, iPod, iPhone, PSP, HTC, Samsung, and more. Customize output HD video effect on Mac - Crop the video play region and remove the black edges easily - Merge all the files you choose into one output file - Trim a video by setting the start and end time or casually drag the slider bar - Add watermark to your videos with personalized text or image - Upgrade video effect (Brightness, Contrast, Saturation, etc) Fast Conversion Speed and Easy to Use Provide the fastest conversion speed. In just few clicks, the HD video conversion will be finished. The converted files will play the same as the original ones. EDM2014 Video is a standalone videoplayer, and part of the upcomming EDM2014. It is a lightening fast and reliable videoplayer without the need of any external codecs. Now with playlist option and enhanced Video quality. *Tired of low quality web video? Framecaster is a free application that helps people share their moments with family, friends, or the World. Framecaster makes it fast and easy to manage, watch, and share high quality video on Facebook and YouTube! RZ Blu-ray Copy is an All-in-one Blu-ray/DVD copy software for making Blu-ray/DVD backup of your Blu-ray/DVD movie collestion. It allows you to copy any Blu-ray/DVD within one step, and auto remove any all known Blu-ray/DVD copy protections. Want to make your own movies? Or maybe you just want to finally burn that film collection on your computer to DVD. Directors NotePad helps amateur film makers organize their ideas shot by shot, and view them on screen in slide show form and as printed lists organized in edit order (scene order. It's also a tool to pre-visualize edits before you start. Free FLV to AVI MP4 Converter is designed to convert your FLV encoded video content into the most popular and wide spread video formats which are used on desktop computers, mobile phones, laptops and removable devices and various audio players. CamWiz Webcam Recorder lets you take total control of webcams on your mac. You can use it to view, record and play back webcam video.Â The recorder has a modular design to allow easy upgrade. Create video file from a series of photo images and music files and 2D/3D transition effects. Rich Video Converter is a fully-featured program to convert videos into the most popular formats for all devices. Better still, Rich Video Converter allows you to extract audio from the video files, take a part of video and split videos by file size. FLV Converter Free is an intuitive program which converts your favorite FLV video files to ANY available popular video format for playing on iPod, iPhone, PSP, Zune. This site does not contain serial number, crack, keygen Jihosoft HD Video Converter for Mac serial number : serial number is the simplest type of crack. A serial number(cdkey,product key,etc) is register the program as you may already know. a crack or keygen may contain harmful software. If you cannot find the exact version you want, just give it a try. for more information read .nfo/.txt/.diz file include in zipped file.